This article first appeared on September 6, 2016 on BusinessWire.com. 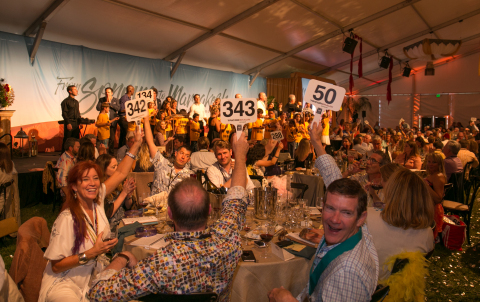 SONOMA, Calif.–Under a tent that transported auction guests from Sonoma to Marrakesh, the 2016 Sonoma Harvest Wine Auction held on Sunday, September 4 at Chateau St. Jean Winery, sponsored by Visa Signature® and TricorBraun WinePak, exceeded the earnings of prior years with proceeds that totaled more than $4,600,000 at the annual fundraising finale of Sonoma Wine Country Weekend. Vintners and winegrowers from across Sonoma County hosted 650 guests who raised their paddles high to support the event that will benefit a number of local charities, and continue the Sonoma Harvest Wine Auction focus upon the Fund the Future initiative, a multi-year commitment to improve childhood reading levels across Sonoma County. Encouraged by Auctioneer Scott Robertson, bidders raised paddles throughout the afternoon which began with ambient belly dancers and a live camel, to win lots that ranged from extremely-limited wines, to exclusive trips and experiences. The top selling lot of the day, the Two Nights of Hollywood Glamour with a trip to the VIP Golden Globes Party and a Private Film Screening was contributed by Jean-Charles Boisset and Buena Vista Winery and sold for $220,000. The top wine-only lot which sold for $65,000 was a collection of 153 magnums of wine, which celebrated the Ladies of Magnum Force, women of the Sonoma wine world that have raised more than $500,000 over the last 13 years. The top bidders of the day were Joe Anderson and Mary Dewane of Benovia Winery who generously supported the event with several purchases, as well as lot donations and the addition of a group of generous bidders from Southwest Florida. Other visiting bidders from New Mexico, Texas and Oklahoma were invited by vintner Robert Kamen. The 2016 Sonoma Wine Country Weekend Co-Executive Directors Maureen Cottingham (Sonoma Valley Vintners and Growers Alliance) and Jean Arnold Sessions (Sonoma County Vintners), along with the members of their Boards of Directors, are thrilled with the $5,712,000 gross proceeds that the entire Sonoma Wine Country Weekend raised. Sonoma Wine Country Weekend is the signature three-day celebration of Sonoma County’s wines, winegrowers, chefs and the independent, generous spirit of this world-class wine country destination. For more information about Sonoma Wine Country Weekend, visit SonomaWineCountryWeekend.com. As Sonoma County’s leading annual wine fundraising event, Sonoma Wine Country Weekend brings the wine industry, chefs, and guests together to invest in our community by supporting youth and children for future success, preserving our environment, and improving health and welfare of our local communities. A partnership between Sonoma Valley Vintners & Growers and Sonoma County Vintners, Sonoma Wine Country Weekend features Taste of Sonoma at MacMurray Estate Vineyards, Sonoma Harvest Wine Auction at Chateau St. Jean, Sonoma Starlight at Francis Ford Coppola Winery, and an assortment of intimate and exclusive winery lunch and dinner parties at multiple locations throughout Sonoma County. To date, more than $24 million has been invested in Sonoma County’s future. For more information visit SonomaWineCountryWeekend.com. The Sonoma Valley Vintners & Growers Alliance (SVVGA) is a non-profit trade organization serving over 500 members who share a mission to promote awareness of Sonoma Valley’s grapes, wine, and history as the birthplace of the California wine industry. Sonoma Valley comprises five of the seventeen American Viticulture Areas (AVAs) of Sonoma County: Bennett Valley, Los Carneros, Moon Mountain District, Sonoma Mountain and Sonoma Valley. For more information on the SVVGA and SVVGF, please visit SonomaValleyWine.com. Sonoma County Vintners (SCV) is the leading voice of Sonoma County wine, dedicated to raising awareness of Sonoma County as one of the world’s premier wine regions, noted for its heritage of artisan winemaking, distinct growing regions, and extraordinary quality. Founded in 1946, SCV represents more than 250 wineries and affiliated business throughout the county. Learn more about SCV at SonomaWine.com. Sonoma Wine Country Weekend is presented by Visa Signature and Visa Infinite. Visa Signature and Visa Infinite offer account holders a range of benefits that provide special access and can save time and money. In addition to points, miles, cash back and other premium rewards offered by Visa Signature partners, account holders enjoy perks such as 24/7 complimentary concierge services, the Visa Signature Luxury Hotel Collection and exclusive offers for fine wine and food, travel and sports and entertainment events. For more information on Visa and issuers offering Visa Signature, visit VisaSignature.com.